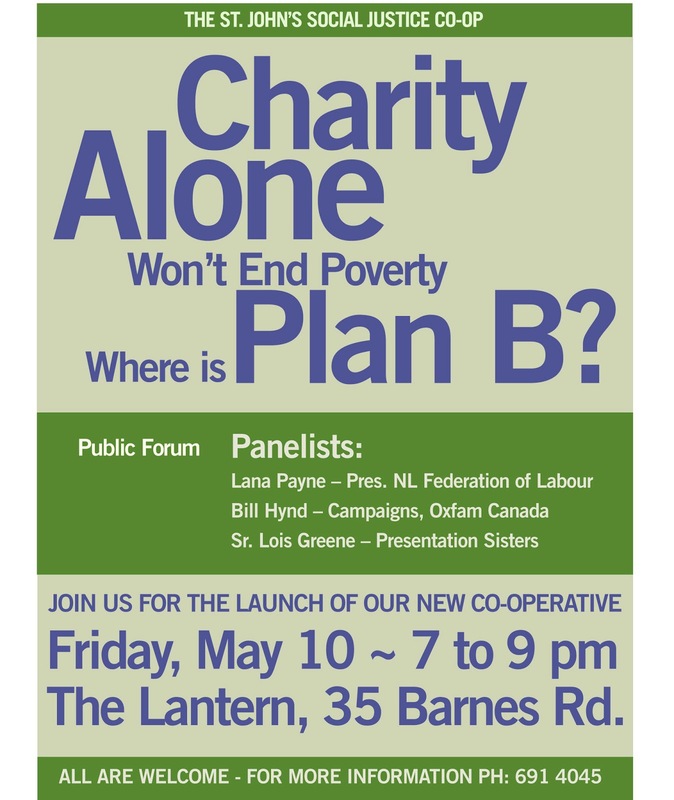 Why we need a Social Justice Co-op in Newfoundland and Labrador right now. You are invited to participate in the launch of the newly incorporated St. John's Social Justice Co-operative -- Friday May 10, 7 to 9pm at The Lantern, 35 Barnes Rd. Social justice is under attack as never before, in our province, our nation and around the world. At all levels – locally, provincially, nationally and internationally – corporate values and neoliberal ideology prevail. Our governments make terrible decisions and people are suffering. Inequality and injustice are becoming more extreme. So we have decided that we need a Social Justice Co-operative as a slightly different formation to other efforts to take on these issues. Existing groups are struggling for lack of money, staff and resources. They are muzzled by government control. If ever we needed to come together to advance and protect the cause of social and economic justice here and throughout the world it is NOW. The idea originally arose out of the need to have an organisation 'with similar aims to those of Oxfam' to take over the Duckworth St building. But it has become clear that whether we have the building or not, our community badly needs a Social Justice Co-op to help facilitate and coordinate all the frustrated energies in our community as more and more cuts come down the line and more and more NGOs find themselves without resources and muzzled. We need to get together and build our energy, and above all, develop a free and unfettered voice that can speak out against increasing inequality and injustice both in our own community and around the world. 1. The Social Justice Co-op will not be compromised or hampered in speaking out loudly and clearly. It will not accept money from any sources that might seek to control what we say and do. 2. The Social Justice Co-op will seek to act as a focal point for all groups and associations in the province who seek social justice. 3. The Social Justice Co-op will engage the community in a process of collaboration to conduct research, public awareness campaigns and advocacy. 4. It will coordinate and strengthen existing projects and campaigns aimed at increasing social justice and work with others to develop new ones. 5. The Social Justice Co-op will create shared resources to support all kinds of social justice work in the community.